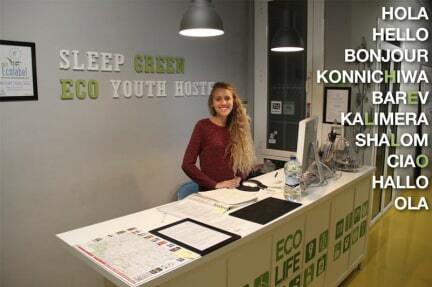 Sleep Green - Certified Eco Youth Hostel i Barcelona, Spanien : Boka nu! - lots of maps and insider tips plus friendly and helpful staff who are always there to make your time in Barcelona memorable! DIRECTIONS: Look out for the restaurant TGB (The Good Burger) and Pont Reyes (electronics store). The entrance to the hostel is in-between these two places. 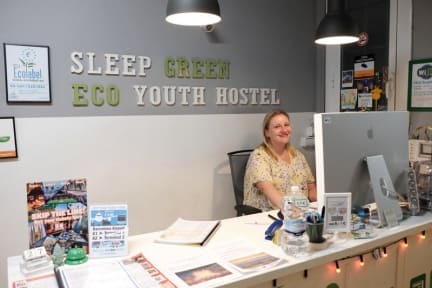 Ring the bell that says Sleep Green Hostel. AGE RESTRICTION: We only accept guests under the age of 18 if accompanied by an adult or with the parents’ authorisation. We do not accept guest older than 45. We reserve the right to refuse admission. CANCELLATION POLICY: A cancellation free of charge must be done at least 48 hours before the 'Date' of arrival. If you do not show up for your reservation and do not contact us, we will charge the first two nights of accommodation cost to the credit card. In case of cancellation on the same day of arrival, on weekends or special events, we will charge the first two nights of your booking. IMPORTANT: If you do not arrive at the indicated time, and do not inform us about a later arrival your booking will be cancelled at midnight. For the safety of other travellers we can not accept any traveller with bed bugs bites. Please consider this before proceeding with your booking. 0.75€ city tax is not included in the price. We normally have beds available for walk-ins. Great hostel with superfriendly staff and huge environmental focus!